"NOBODY MOVE NOBODY MOVE AT ALL, I'VE GOT A GREAT IDEA"
It was the end of April in 1999. That long traumatic winter when it snowed and snowed and snowed. Having spent the season in Switzerland I was looking forward to a kind of break, 1 week following the BASI III introduction ski course. I arrived at the weekend and met my host Radu. Radu is a big bear of a guy who had been an instructor in Ceausescu's Romania. He looked every inch a Mafia don and ran the Andorra Franchise of a UK based Tour Operator pretty much as his local fiefdom. Radu had arranged for me to stay in one of the chalet's. This had been the home to a bunch of Antipodeans and had yet to be properly cleaned. The first thing that struck me was a pad on the table where someone had copied the Managing Director signature from a ski brochure a dozen times. It was quite a good copy and later that week we would discover why. I unpacked my gear and Radu came back with a bunch of lift passes. These were for each of the Andorra stations and had belonged to members of the team. We scanned through looking for photos that looked vaguely like our own. I seemed to resemble an Aussie bird and I got another one that was a doppelganger for Ian who would join us from Toulouse. I looked out of the window, it had started to snow and didn't fancy being Ian driving up the long mountain road from France. We got out a bottle of whiskey (tax free in Andorra) and Radu told me what had been going on that season. When he'd first started in Andorra he'd discovered that you could by cheap Spanish wine down the valley for a few pesetas a litre. That year he'd had a new manager in one of the hotels. The manager was complaining that the bar takings were way down and costs were up and that he looked like he'd miss his bonus. He couldn't work it out as he'd made some improvements on the previous year. "what kinda improvements?" Radu asked. Well it seemed that he'd replaced the rot-gut wine Radu had been serving with something drinkable in the hope this would encourage guests to spend more in the bar. Radu told the manager that people come to Andorra to go out, après ski is still a big part of the average punter's life. The wine Radu served was so undrinkable that after half a bottle the guests had to buy at least a beer in the bar to wash the vinegary taste away. They go out anyway, this way they stop for at least a drink before heading into town. Around 25 cm of snow had fallen overnight and Ian had found the haul over the pass at Grau-Roig a bit delicate but now the slopes were bathed in warm Catalan sunshine. We headed up to Pal for the last day of the season there. Most of the lifts were running and the slopes were nearly empty. After a few pistes we headed for the powder. Pal has some excellent off piste between the trees. Towards Arinsal the slopes are more challenging but their is plenty of space in the woods to ski. Pal and Arinsal are now joined by a lift, although the frequent disputes that rage between the ski stations means that you should check if it is actually running. The cable car links Port Negre and Setúria in only 6 minutes giving a potential capacity of 500 persons per hour. Arinsal is in a valley with few trees, great if the weather is clear and it offers the more challenging skiing of the two with a height difference of over 1000 meters. Monday saw the start of our course, based in the luxury Sporting Hotel in Soldeu but most of the week was spent on skis. I whole heartedly reccomend the sporting, it is an attractive, spacious hotel with polite and helpful staff. Soldeu itself offers a few bars, shops and some steep pistes back to resort. In theory it is linked with Grau Roig but again arguments between the warring families mean these links don't always run. There is direct access from the villages of El Tarter and Canillo. There is 90km of varied skiing, much in woodland. The course had over a hundred participants trying for their BASI I, II and III grades. At the time the BASI I was not widely accepted in the alpine countries but I can assure you that anyone with this grade is truly an expert skier. I saw one of the instructors from Klosters, he already had BASI II but was trying for the next grade. He's a superb skier, on and off the piste but found the technical difficulty of BASI I quite a challenge. BASI had always prided itself on its teaching methods, which it believed to be superior to the French exams but BASI I was coming to resemble the French Capa (now Eurotest). This would soon pay dividends with the final acceptance of BASI teachers by the French the following season. Andorra has a large contingent of English speaking instructors, it is possible to teach beginner groups with BASI III, although the pay is not that exciting. One of the girls on my course had already got her Canadian exams. The Canadian body runs courses in Europe and she said that you really only have to ski well to pass their exam. A bit of kudos amongst friends but not a piece of paper that has wide acceptance in Europe. For anyone thinking of going the BASI route a couple of things stand out. In France over 95% of ski instructors took part in ski competitions. Also need good technical understanding of skiing, it is no good being able to ski well if you cannot explain and demonstrate basic manouvers to beginners. The pioneering resort in Andorra located on the watershed of the Pyrenees. Its northerly orientation and high altitude (2050 - 2640 m) practically guarantee the quantity and quality of snow throughout the season, backing this up with 427snow canons which can cover more than 626 hectares (27 km of ski runs). The resort has 100 km of ski runs, 1 cabin lift (Funicamp) which links Encamp to the upper altitude at Grau Roig, 14 chair lifts, 16 ski lifts, 3 ski schools with 180 instructors, 2 snow gardens, 1 creche, 1 snowpark and 1 mogul stadium. Tuesday we learned that Grau-Roig and Pas would close for the funeral of the son of the owner. In fact much of Andorra shut down as a mark of respect. The son had died heliskiing at the weekend with a guide, there was a suggestion that the helicopter might have triggered the avalanche. With Pal and Soldeu now shut for the season this left a longish haul up the Ordino road to Arclasis. This resort is split over two sides of a ridge. On the car park side the runs cascade down some interesting slopes consiting of gorges and gulleys. There are lots of between the piste variants which offer a challenge and trees if the weather is bad. The olther side is more limited and much more bleak. Two principal runs track down a back bowl to a chair lift. This could be great fun on a winter powder day though. This ski resort is located in the middle of the valleys of Arcalís and La Coma, from where you can enjoy the wild, intact scenery of the sector. The resort goes from an altitude of 1940 m. up to 2,620 m. and has 26 km of ski runs, 5 chair lifts, 8 ski lifts, 28 snow canons, a ski school with 40 instructors, a snow garden and creche for the little ones and a snowpark for surfers. Closely linked to the delivery of mail, skiing began in the Principality of Andorra in 1924. It snowed abundantly that year and Soldeu's postman, Miquel Farré, decided to exchange his snowshoes for the long pieces of wood he saw being used by the inhabitants of the French village of Porta where he went once a week to pick up part of the mail. When the people of Soldeu saw Miquel arriving on these strange pieces of wood attached to his feet, they were amazed. But his fellow postmen were not slow in copying him to carry out their duties more efficiently. That is how the first skis arrived in Andorra, not for sport but as a way of overcoming the difficulties in getting about due to snow in those harsh winters in the Principality. Nearly 80 years later, Andorra has some of the most important ski resorts in the Pyrenees. With over 2,500 skiable hectares, over 250km of pisted ski runs, nearly 900 snow cannons, one of the widest varieties of skiing available, acclaimed ski schools, superb facilities for families and groups, and some of the most dramatic scenery, Andorra is continually improving its services and its infrastructure to offer some of the best possible skiing in the Pyrenees. 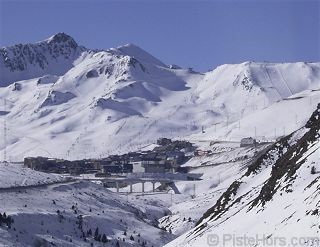 La Principauté dAndorre dispose du domaine skiable le plus grand des Pyrénées. Le pays propose 4 stations de ski alpin et une station de ski de fond. Sur une extension totale de 2625 hectares, les stations offrent 279 Km de pistes, 1 téléférique, 4 télécabines, 42 télésièges débrayables de 2 à 6 places, 50 téléskis, 15 Km de pistes de fond et plus de 1.213 canons à neige qui garantissent la pratique de ce sport de glisse toute la saison durant, et ce, pour un territoire de seulement 468 Km2.